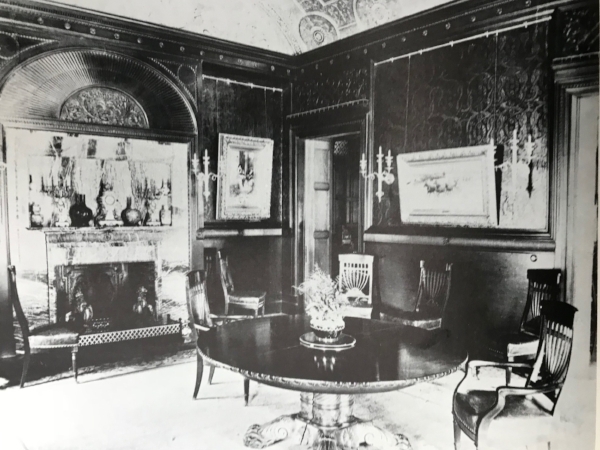 While the name Fahnestock might not immediately roll off the tongue today when ticking off America’s great gilded age families, during the era they were undeniably important. 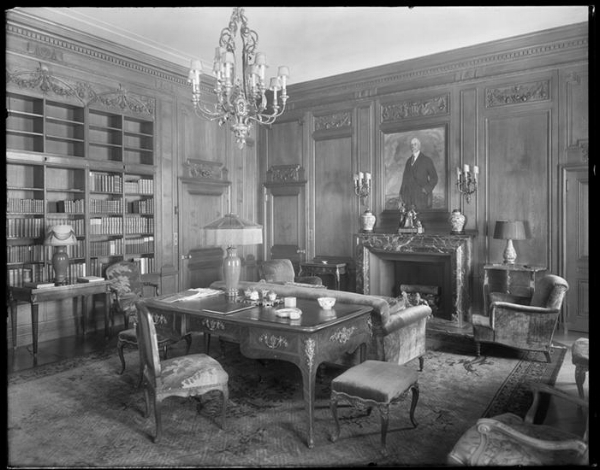 The wealthy family took leading roles in the business, philanthropic and social circles of Washington DC, New York, and fashionable east coast resorts of the day. Over the next two posts, I will take a look at their homes, focusing on their residences in town in this first installment. Harris C. Fahnestock, who founded the family fortune was born in Harrisburg Pennsylvania in 1835. He went to work for an uncle’s bank at a young age. Swiftly rising up the ranks, he was invited to become a partner at Jay Cooke and Co. in Washington D.C. in 1862, working with the Treasury Department and eventually becoming a financial advisor to President Lincoln. 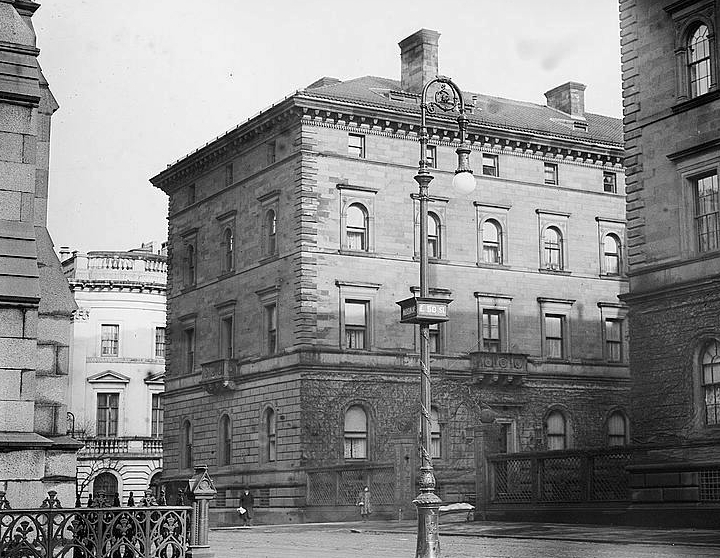 After the firm went bankrupt in the 1870s, Fahnestock joined the First National Bank of New York as Vice President, remaining there for the next 40 years. He also founded the investment firm of Fahnestock & Co in 1881 with his son WIlliam (which eventually became Oppenheimmer Funds), made canny investments in railroads and held multiple directorships or partnerships in other businesses. All this made Fahnestock (and in turn his six children) very wealthy. While the Bank of America building replaced Fahnestock's former home in the early twentieth century, it most likely looked like its surviving midblock neighbors. When he first moved his growing family to Manhattan,(he and his wife Margaret would have five sons and a daughter altogether) they settled into a handsome townhouse in fashionable Murray Hill at 292 Madison Avenue, between 40th and 41st streets. A decade later, a far more palatial opportunity would present itself roughly ten blocks to the north, in the form of the Villard Houses. The group of 6 townhouses, which occupied the entire blockfront of Madison Avenue between fiftieth and fifty-first streets been the brainchild of Henry VIllard. Cohesively designed around a central courtyard by McKim Mead and White, they resembled one enormous Italian palazzo from the outside. Work had begun in 1882 but came to a screeching halt in late 1883 when Villard went bankrupt. His real estate venture was put into trusteeship and his own enormous, almost-finished mansion, which occupied the southern portion of the complex was put up for sale. In 1886 one of Fahnestock’s business partners purchased a townhouse there and convinced him to buy two adjoining ones in the northern portion of the block. Unfinished shells, Harris had plans drawn up to combine them into a single, larger home. Restrictive covenants put in place to encourage the sale of Villard’s mega-mansion across the courtyard prevented him from doing so however (luckily a buyer for it was found in the vastly wealthy mining heiress Elizabeth Mills Reid that same year). 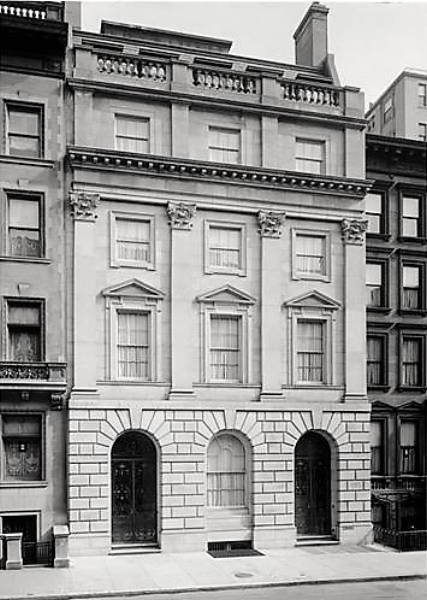 Nonplussed, Harris settled into 457 Madison Avenue and gave his son William the adjoining house (22 west 51st). 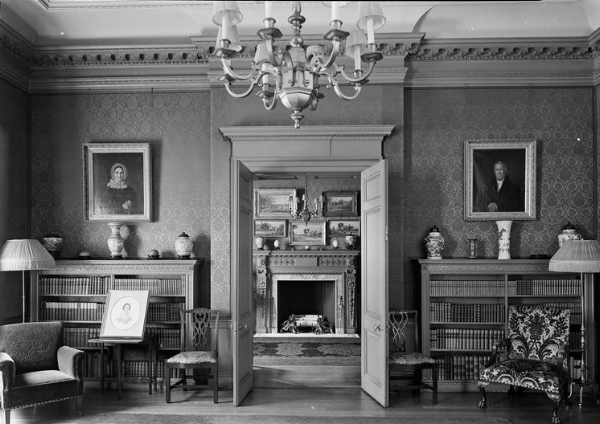 Harris had the interiors of his house completed to the original designs of McKim Mead and White. Around the same time, he purchased the empty lot behind the complex, commissioning the firm to design a handsome brick and brownstone townhouse for his son Gibson at 30 East 50th Street, built at a cost of $40,000. As other children grew up and began families of their own, he also gave them houses nearby. Son Ernest was ensconced in a mansion at West 54th street and Harris Fahnestock Jr. on West 52nd street. While Harris and his wife were respected members of society, (often the case with the great gilded age families) it was the following generations that would cement the family’s reputation and live on in the public’s imagination. As the nineteenth century moved into the twentieth their collective wealth grew, his children began to spread their wings, eventually eclipsing their parents socially and architecturally. The first was Gibson. Already possessing homes in Newport and New York, he decided to build a mansion on Massachusetts Avenue in Washington DC tapping Nathan Wyeth to design it. A prolific Washington-based architect, Wyeth was responsible for a large number of the capital’s gilded age mansions, as well as the West Wing of the White House. The resulting beaux arts mansion, constructed between 1909 and 1910 was designed for entertainments, and became one of the social centers for Washington’s “300”. 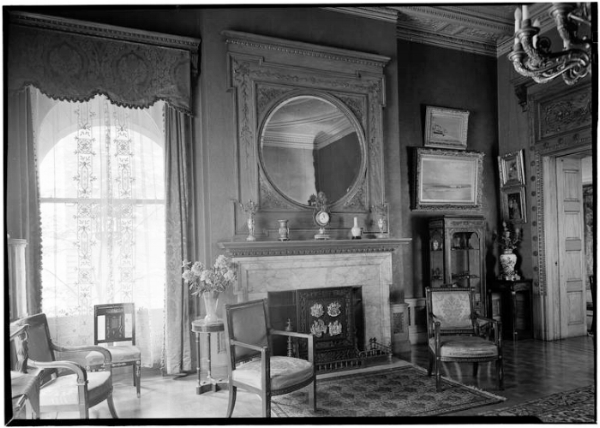 After Gibson’s death in 1918, his family continued to occupy it for a number of years. Today it is the embassy of Haiti. One good thing about embassy conversions – although modernizations are always needed, the grand staircases, ballrooms other formal public spaces tend to stay intact! In 1910, Harris purchased a third home in the Villard complex from Roswell Smith at 24 West 51st for his daughter Helen, then married to Dr Clarence G. Campbell (historically the Villard Houses might have been more aptly called the Fahnestock Houses at this point). Some were changes made, including enlarging the entrance portico, but the interiors still retained a good deal of the original details. A noted philanthropist, she divorced Campbell In the 1920s, marrying John Hubbard in 1928 and spent a good deal of her time in France, but occupied 24 West 51st until her death in 1955. Harris Fahnestock died in 1914, leaving an estate of $17.75 million dollars, which was split evenly between his six children. While already rich, this influx of wealth spurred several of his children to embark on grand building projects. Around 1915 Harris Fahnestock Jr. followed the trend of many of his peers and decided to move out of the increasingly commercial 50s, purchasing two adjacent brownstones at 13 and 15 East 66th street. He employed Hoppin and Koen (who had previously designed his Lenox estate) to produce a Palladian style mansion to replace them. The sublime interiors reflected the quasi-English exterior faced in limestone. Sold out of the family after his death, it eventually became a consulate for the Philippines, notoriously serving as a Manhattan pied a terre for Ferdinand, Imelda Marcos AND her shoes during their reign. It was later converted into several large residential apartments. Like his brother Harris, Dr. Ernest Fahnestock also decided to move uptown in the twentieth century. Instead of building a new house, he opted to buy an existing townhouse, at 954 Fifth Avenue. Soon after his death in 1937, his estate sold the mansion, which was razed with its neighbor for a new apartment building. After Harris’ death, his son Dr Clarence Fahnestock occupied 457 Madison Avenue. 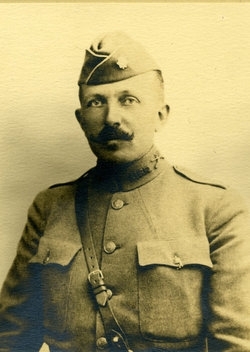 A clubman, big game hunter and patriot in addition to being a doctor, he volunteered to go to France during World War 1, dying of Influenza on the front lines there in 1918. William, who lived next door, then acquired his father's former house. By the 1920’s restrictive covenants placed on them had expired and William was able to do what his father had contemplated. He hired architect Charles Platt, who had done work for him in Newport and Westchester to join the two mansions together and create a larger home. Platt's plans for combining the homes, which included the elimination of the 51st st entrance. While the exterior changed relatively little, the interiors were reconfigured and given a lighter french-inspired air. It passed out of the family’s hands in the 1950s, first to the Archdiocese of New York, eventually serving as the headquarters of the Municipal Art Society, and today it is the Trunk Club, an upscale clothier. Looked at collectively, these homes allow one to see how the family contributed to the look and architectural tone of the era. While none remained the family, we are fortunate in that the exteriors of most of them (as well as some of the interior detailing) remain intact. 13 East 66th st is currently undergoing a complete gut renovation - perhaps to be converted back into a single family residence for one of today's billionaires? Next Installment - Click here for Part 2 which looks at the family's country homes. 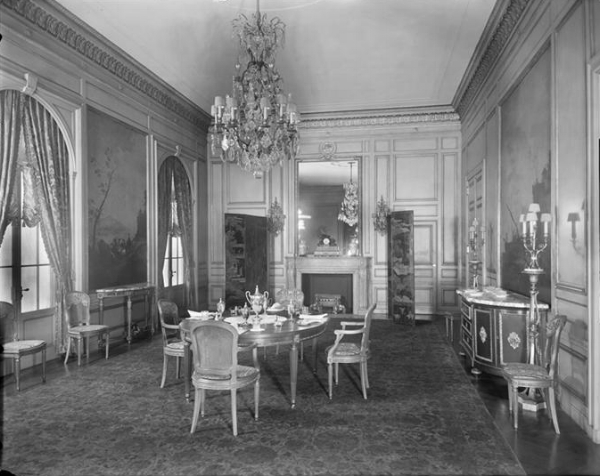 For more photos of Helen’s, William’s and Harris Jr"s homes, the Museum of the City of New York Digital Archive provides an excellent resource. Next, Part 2 will explore some of the family’s country seats.